2014 being the anniversary of the first four minute mile ever run on 6th May, 1954, by Roger Bannister at Iffley Road Track in Oxford. The story about how Roger and the ‘two Chris’s’ managed it is by now well known and there are many journal and website articles about it. Universally hailed, there were one or two dissenting voices at the time (and there are still some to be heard) that it it was not the done thing to use pace makers – indeed on the very day one of the officials there who were required to sign the form ratifying the record refused to sign until heavy pressure was brought to bear upon him. Several years later every runner in a British Milers Club race in the South West was disqualified because a pace maker had been used in the actual race. Video of the race can be seen at www.youtube.com/watch?v=uz3ZLpCmKCM and an account at www.historytoday.com/richard-cavendish/first-sub-first-four-minute-mile explains briefly the previous attempts and the race itself. The third placed runner was Mike Berisford, an Anglo-Scot who was one of a number who were trying to reach a mile time that started with 3. The man most likely had been thought to be one mentioned above – Graham Everett. Other home Scots who had been though contenders for the honour included Graham Stark from Edinburgh and Hugh Barrow from Victoria Park in Glasgow who was a bit younger but very talented. Then there were the Anglos. Berisford was one and the Wenk brothers were also working hard on the task. None of them ever lived in Scotland, none of them had a Scots club affiliation and none of them were at all known north of the border. But the Anglo who might have been first was Alan Gordon, the man who had run in the actual race where the first four minutes was run. Gordon was a very talented runner who took part in several of the four minute miles of the era and at one point he had run in more sub-fours than anybody else but had never dipped below the magic figure himself. A one point he confessed himself to be uncertain why he never did so: in an interview with Doug Gillon he said that Graham Everett had paced him on one occasion to get the time but he was out of sorts and didn’t manage it. He himself paced Tabori to the clocking coming through 440 in 60 and 880 in 2:00.8. There were several races where Everett, Gordon and Berisford all ran well in the same race but none of them got there. Despite the best efforts of Scots runners to beat the clock, it was not until 1961 that a Scot ran inside four minutes, and not until 1970 that a Scot ran the time inside Scotland. It was not for want of trying though. The table below shows the progress of the Scottish Native Record for the Mile (performances made in Scotland by competitors born in Scotland). It was a long wait – sixteen years after Bannister before Scots could see a Scot run under 4 minutes. It was a hard battle to get there at any venue and the progress is indicated in the table below. 19 June 1957 White City 6 A Gordon 4:03.4 Fastest ever by a Scot. Berisford was born in England in 1936, he lived in England and ran for an English club, appearing seldom north of the Border. Very few of us would have recognised him. He did compete in Scottish championships and won the 880 yards in 1961 and mile in 1962. He raced against Everett many times, usually coming off second best but on 18th August 1961 he went into the Emsley Carr Mile at the White City in a race won by Jim Beatty (USA) in 3:56.5, and finished fifth in 3:45.2 to win the race to be first Scot under 4 minutes. He was a Scot under the rules and that is what matters when compiling rankings but we would rather have seen a home Scot doing it. Graham Everett would have been a popular man to have done it, Alan Gordon should probably have done it in 1955 or 56 and later on Hugh Barrow or Graham Stark were also capable: Barrow’s three quarter mile record of 3:00.5 and pb of 4:01.0 indicate that it was possible. 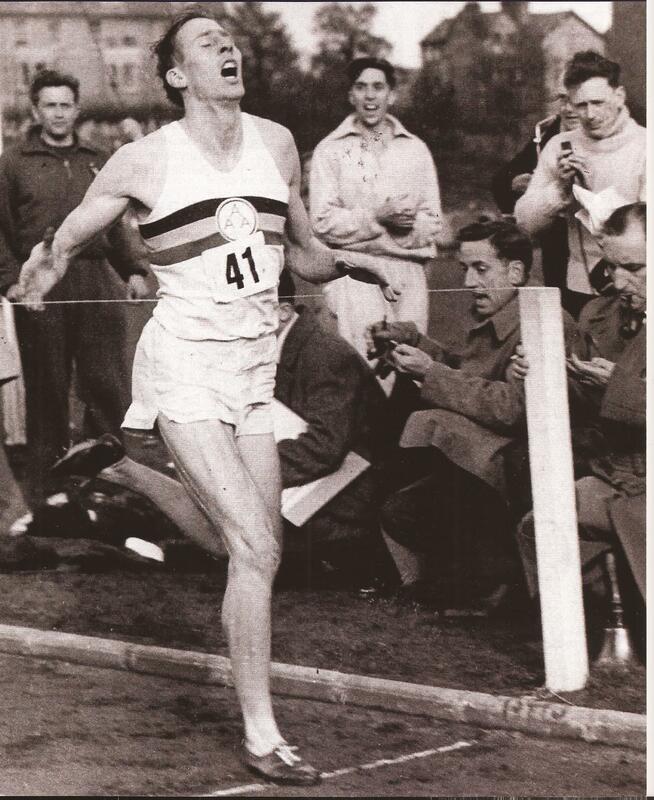 However – Bannister 3:59.4 in Oxford was first in 1957, Ibbotson 3:58.4 was first in Scotland in 1957, 3:59.2 Berisford was first Scot in 1961 and Stewart was first Scot in Scotland in 1970. Stewart of course was from Birmingham and later chose to run internationally for England after running for a couple of years for Scotland. Scotland’s really great period of miling was still to come with the likes of Clement, Robson and Williamson being regularly under four minutes and members of many GB teams. I’m a wee bit sceptical about the time, but then I’m sceptical about lots of things. The remark that he didn’t regard it as that important is a strange one when there was a great deal of coverage of the quest for the four minute mile with John Landy in Australia and Wes Santee in America only the most prominent searchers for the prize. More significant is an article by James Fletcher on the topic from a historical perspective. It can be found at the BBC website and has some wonderful illustrations. PARROTT’S MILE: Roger Bannister was credited with being the first person to run a mile in under four minutes – but 18th Century runners are reported to have got there first. Why are they not recognised? It was 9 May, 1770 when James Parrott, a costermonger, stood at the Charterhouse wall on Goswell Street, London. He was getting ready to run. For money. A wager had been made that Parrott could not run a mile in under four and a half minutes. If he could, he stood to win 15 guineas – a substantial sum for a man who may only have earned around 50 guineas a year selling fruit and vegetables from a street barrow. With money on the line, it’s likely that umpires on both sides carefully checked the watches, locked them in a box to prevent tampering, and placed them in a horse-drawn carriage that would make sure they reached the finish line ahead of the runner. After the signal was given, Parrott was away, turning briefly up the narrow confines of Rotten Row before emerging onto the flat, wide open space of Old Street. Legs pumping, heart pounding, he ran its length almost all the way to the finish, a mile away at the gates of Shoreditch Church. The result was reported in the Sporting Magazine of 1794: “1770 May 9th, James Parrott, a coster-monger, ran the length of Old St, viz. from the Charterhouse- wall in Goswell Street, to Shoreditch Church gates, (which is a measured mile) in four minutes.” It is the first known report of a four-minute mile. On another May morning 244 years later, Peter Radford retraces James Parrott’s steps. Listen to Peter Radford on More or Less on BBC Radio 4 and the World Service, or download the free podcast Today, estate agents and kebab shops line the route. A massive roundabout has been added. But St Leonard’s Shoreditch, home of the bells of Shoreditch from the famous nursery rhyme, still looks much as it would then, although these days it’s perhaps best known from the BBC sitcom Rev. “The ghost of it all is still here,” says Radford. “All of the new buildings are clustered around the road which is exactly the same as it was then, with the same bends and twists and turns and width as it was then.” Radford is a retired professor of sports science, and also bronze medallist in the 100m and 4 x100m sprints at the 1960 Rome Olympics and broke the World Record Holder for the 200m in 1960.. He has a passion for runners from the past, and it’s largely thanks to him that we know of the achievements of James Parrott and others like him. He has collected more than 600 records of running races from the 18th and 19th Centuries, revealing a rich culture of running and athletic achievement. “Women did it, girls did it, men did it, young men did it, old men did it, fat men did it,” Radford says. “Sometimes for a wager someone would say, ‘I can run two miles in XYZ time while eating a chicken’.” Among those records there are further intriguing hints that the mile may have been run in under four minutes. WELLER’S MILE: Then in 1796, the Sporting Magazine reported that a young man called Weller, one of three brothers, “undertook for a wager of three guineas to run one mile on the Banbury road, in four minutes, which he performed two seconds within the time.” In other words, a mile in three minutes, fifty eight seconds. From a modern perspective, it’s natural to assume that the further back in time we look, the slower people were running. We also have the benefit of distances measured to the millimetre and times recorded automatically to a hundredth of a second, so when confronted with stories of naked, chicken-eating runners, and reports of races published decades after they took place, it’s easy to dismiss the old times as errors or tall tales. But Radford argues that at the time of Parrott’s run, agricultural chains would have been able to measure the distance to within a few inches. And, by the late 18th Century, the best watches were extremely accurate. Even a watch that lost five seconds a day could still time a mile to within a second. Crucially, the culture of wagers gave everyone a strong financial incentive to get it right. “The two parties agreed that there hadn’t been any advantage taken by one side over the other,” Radford says. “It’s not like a diary entry where somebody said, ‘I did so and so’ and they could make up whatever they wanted.” But any individual result could always be compromised by dodgy technology or dishonest or inaccurate reporting, so Peter Radford has applied the tools of statistical analysis to all of the hundreds of results he’s collected. “It’s only when you look at them and gather them together that you begin to see the patterns emerging,” he says. Very broadly, his method is to take the best results in any given era over a range of distances and plot them on a graph. Results that are suspect stand out and can be discarded, and those that remain can be seen as more reliable. You can also extrapolate from the times at other distances to see what the ‘physical culture’ of the time might have been capable of achieving over the mile. “You begin to see that they’re not a random collection of oddball times and distances, they have an internal mathematical logic to it. The argument increases in strength all the time that there were some quite extraordinary athletes in the 18th Century.” Radford recently ran the numbers based on all the races in the period covering Parrott’s run. Factoring in the margin of error, the best possible one-mile time would be anywhere between 4m 13s and 4m exactly. The article is fascinating and the accompanying pictures and maps that you will find at the BBC website add tremendously to it. The four minute mile may be almost commonplace today but regardless of how many men, and surely women in the future, run it, it will still retain its magic.